Are you contemplating parenthood or perhaps you are already on that 9 month journey before birth? Maybe you are new to Prague and have many questions regarding health care for your child(ren)? If so then these two free seminars conducted in Czech and English by respected specialist Petra Sovova (and mother of 7) are not to be missed! The first seminar is October 13 at 6.30pm and is titled Health, Safety and Harmonious Child Delivery in the Czech Republic. 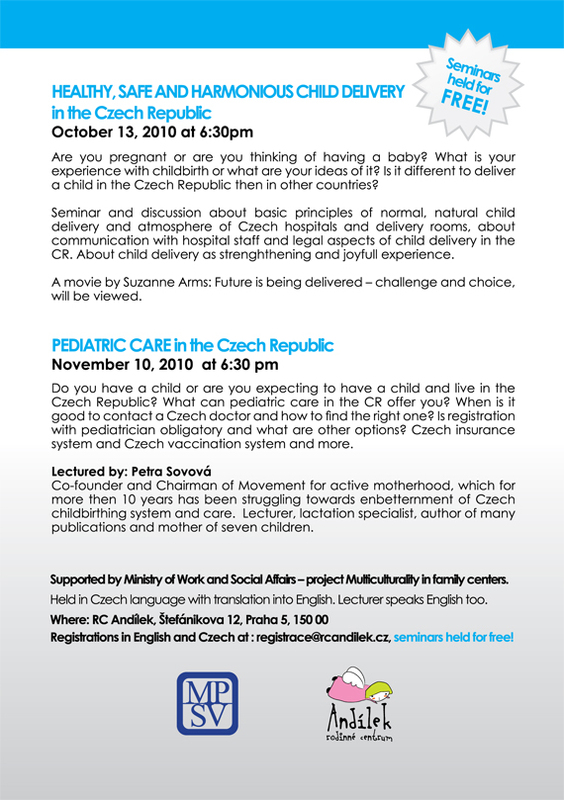 The second seminar will be held on November 10 at 6.30pm and is titled Pediatric Care in the Czech Republic. No one knows better than me the concern and worry that one has when starting the journey to parenthood in a foreign country. Yes I do have a big advantage in that my husband is Czech but the system here is very different from my home country and the language barrier often left me feeling quite confused and helpless. My only birth training was a standard lecture in Czech at Podoli for soon-to-be parents. How I would have loved to have attended these two seminars! The venue for the seminars is the proactive Andilek Family Centre (Rodinne Centrum Andilek) right opposite Novy Smikov in Andel. Credit must be given to Mirka and her team at Rodinne Centrum Andilek who with a grant from the government choose to support foreigners living in Prague allowing us to attend these essential seminars. Thank you Mirka! !